In my last blog posting I shared some tidbits from this years’ Rune Round. It is time to expound on that topic, both on what the tour participants (most of which call themselves Runatics…) experienced on the second day, but also on why these events are so important. 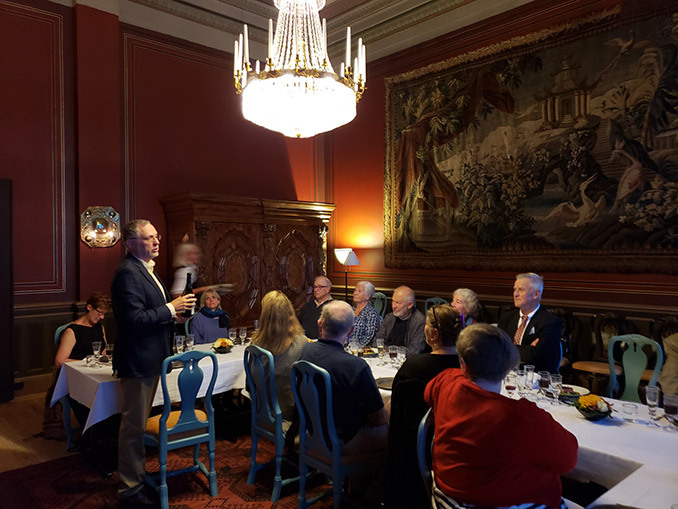 First, however, I should write a few words about the dinner that Uppsala University Deputy Vice-Chancellor, Professor Anders Malmberg, invited the nine rune rounders to in the Vice-Chancellor’s State Apartment inside the University Main Building. The dinner was said to be “informal” but our American guests were obviously quite enchanted with the magnificent venue and the fabulous meal provided. With it was served a very rare Runestone wine, the gift of Claiborne Thompson, formerly an outstanding US runologist who turned wine maker! At coffee afterwards we all got to sign the guest book also containing the signatures of the King and Crown Princess of Sweden, among others. Magnus Källström and Henrik Williams flanking U 631. Photo: Loraine Jensen. On the back of the monument is still found a drawing of a couple exiting out of a portal-like frame. This may be the first three-dimensional picture in Swedish art. One of the persons is carrying a cross and has been interpreted to be a missionary or even Christ himself leading a converted woman to salvation. But the clothing of this convert looks typically male, and perhaps it’s a female doing the leading. That would not be surprising given that women were in the forefront of the Christianization process (read more in Birgit Sawyer’s article Women in Viking-Age Scandinavia, or, who were the ‘shieldmaidens’?). 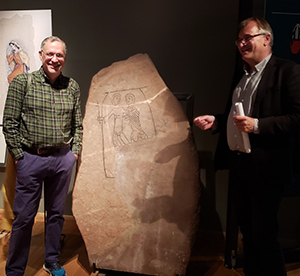 The afternoon was devoted to a visit to the Skansen open air museum, where four runestones were shown by Källström and Williams. The one from Linga is quite exciting. It has a vessel with a mast structure ending in a “crossed” cross and incorporating same-stave runes. Under the boat is found something that has been interpreted as a primitive anchor but is more likely a pictorial representation of the fishing for the Midgard Serpent, a popular motif which here probably has Christian symbolism. Sharing the rich runic treasures of Sweden with interested Americans is a privilege. Not all Swedes, even academics, understand how amazing these monuments are and how important they are as the only original written sources from their time and area. A small group of dedicated people is all that it takes to change ignorance into attention and then knowledge. 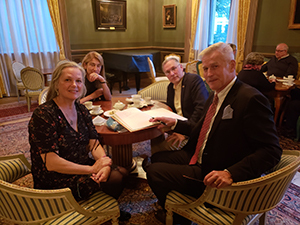 The rune rounders do this constantly on their home turf and a number of them have also contributed generously to Uppsala Runic Forum, for which we are deeply grateful. It has allowed us in turn to support runologists and runic events in (so far) four countries, including the United States. 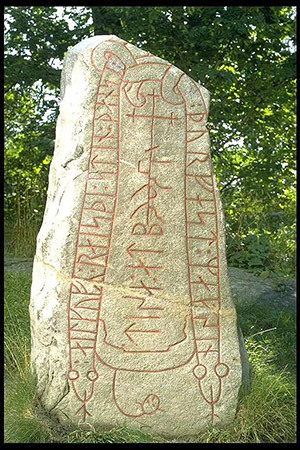 This entry was posted in Swedish Runes and tagged Altuna, American Association for Runic Studies, Christianization, Claiborne Thompson, Magnus Källström, Midgard Serpent, ornamentation, Runestone wine, runestones, Runic excursion, Skansen, Sö 352 Linga, Sweden, The Rune Round, U 631 Kalmar church, Uppland, Uppsala university, Viking Age. Bookmark the permalink. This blog is dedicated all things runic. New finds and scientific discoveries will be presented, but also runic happenings such as lectures, seminars, excursions, and exhibitions. Support us in cracking the runic code! Happy International Day of Runology!